What's the point of taking a class? Build a lasting intuition for the key ideas. During the course, understand it enough to solve problems. After the course, enjoy it enough to revisit. If an idea clicks, write down the Aha! moment in language you'd use yourself. If it doesn't, write down the Huh? moment. Move on and try again later (such as with the ADEPT method). Keep it simple, like the KonMari method of organizing: Look at everything in your house. Does it spark joy? Keep what does, thank and donate what doesn't. A simple study plan: Go through the material. Did it click? Write down what helped, otherwise look for a better explanation. For the major concepts the course depends on, I keep a 5-second summary in mind. This underlying concept, why does it exist? In plain English, what does it mean? Linear Algebra: spreadsheets for your equations. We "pour" data through various operations. Natural log: time needed to grow. Helps normalize widely varying numbers. e^x: models continuous growth, has a simple derivative. Gradient: direction of greatest change, helps optimize. Calculus -Art of breaking a system into steps. With the gradient, we can move in the best direction. I reference these snippets as I encounter new formulas. There was a formula that I expected to be positive ("cost" should be positive), yet it had a negative sign out front. What gives? I would have preferred the equation written another way, and I made a note of this Huh? moment. Huh moment: Why is it named that? Early in the course, we define a "cost" function which tracks the difference between our predictions and the real value. Why not call this difference something normal, like error? As I go through the course, I have a plain-English definition in mind. What's it all about? 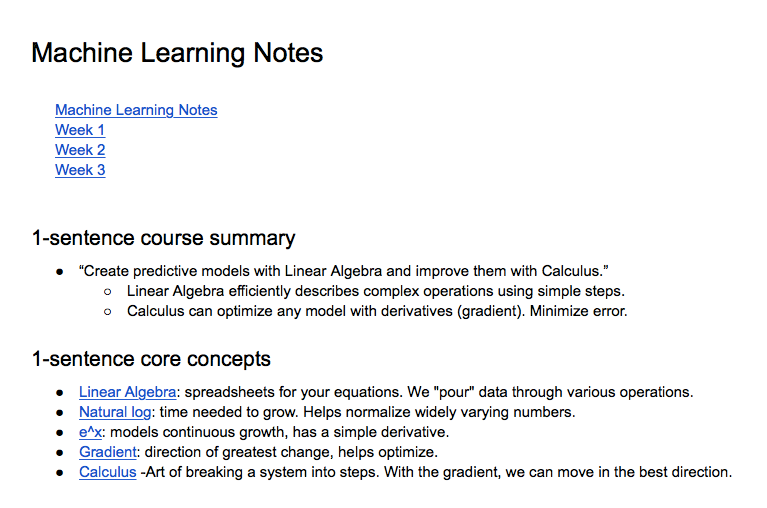 Machine Learning: Create models with Linear Algebra, then improve them with Calculus. Linear Algebra lets us use many (tens, hundreds, thousands) of variables in a "math spreadsheet". 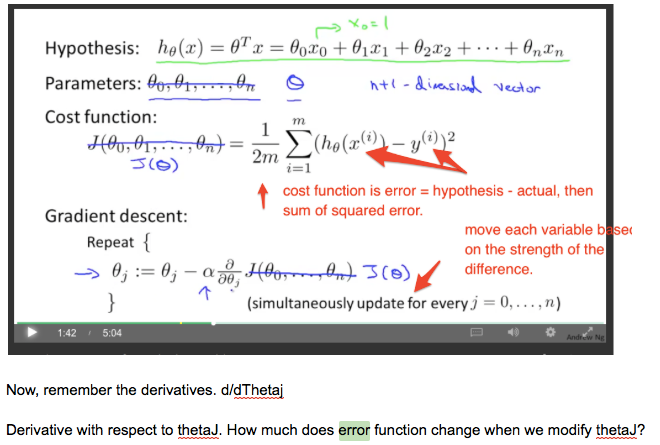 Calculus lets us improve our spreadsheet via feedback on how well it's working. Using functions like e^x, ln(x), x^2, etc. make it easy to take derivatives. Absolute value, if/then statements, etc. aren't easy to work with. Now my thinking becomes: What types of predictive models can I make? If Linear Algebra can describe it, let's use it. Future learning gets that much easier. Remember how you were confused about a topic a few years ago? Well, let's read the explanation you wrote to yourself on how to overcome it. Over time you build up a massive collection. Embrace your confusion. The hesitation you feel when you see a formula is ok. Try to break down each part of the equation, ask what it means, make note of what is confusing and return over time. Every positive sign, every variable, why are they there? It's ok to forget things - I do all the time. I just want a list of intuitions to load up when needed. Often a single phrase or diagram will bring it all back. The textbook already exists. 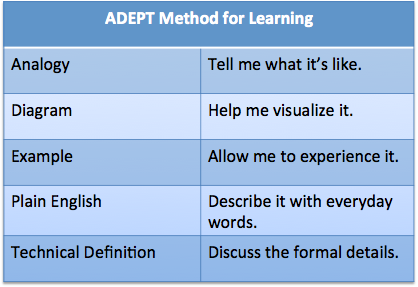 Don't simply copy what the teacher/book said, add what you need to make it clear. This course is among the most fun I've had -- this is what learning should feel like, exploration with constant refinement. I'm curious to see if this approach helps you too. I'm curious to see what works for you, feedback is always welcome. Learning math? Think like a cartoonist.